The streets at night shimmer under the emerging, movement of streetlights. It’s the tree limbs that cause their action. Above them, wires stretch into an evolution of light and dark. Of course, that’s where we kiss. Where else? And it’s a damn good smooch. One of those that fits like two pieces of a puzzle, like it’s meant to be. That’s when I hear you say, “These streets are like our bones, drawn to one another, making a map, an illuminated grid.” You get a scared-like look on your face, as if you said something weird. You did, but I like it. Then chaos……… the shots ring out. I’ve heard them all my life. Some people live their lives to be snipers. But this bullet is no different than the others, hitting me in the head, the heart as well. I know what they’re made out of, nothing but misdirection…….yet…still…..tonight……..part of me lies dead on these living streets. We’re looking at the body, my body. I don’t deny I’ve been hurt….hurt for good. I carry my death around. Always have……… I say, “Bury the body.” We dig deep. Our purpose is ……no one will find out this dimension is a drive-by shooting, quick, violent, darker than irony, lighter than a paradox. For tonight, we kiss in the streets. I kiss you again when the gunfire is but smoke and I swear the streets turn luminescent. Bullets are cold compared to us. 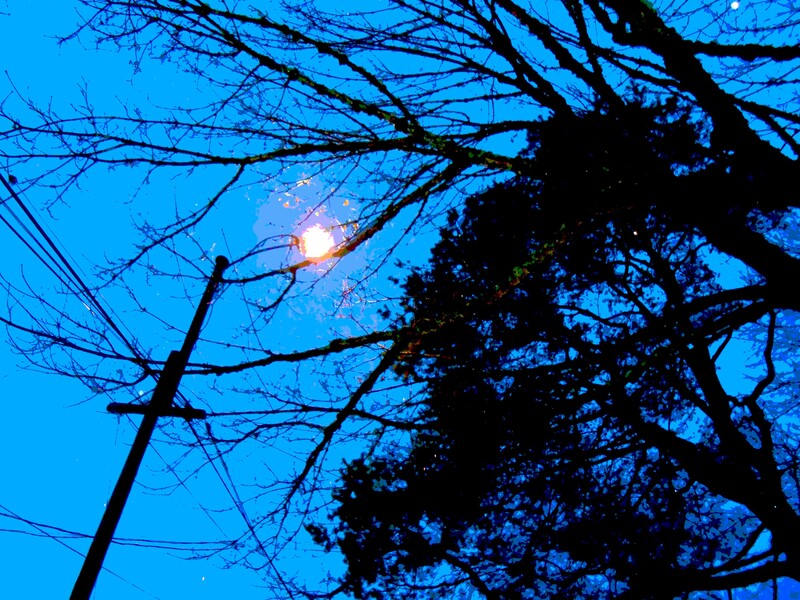 I feel as if I will climb the streetlights to string wires. When the sun rises, I will invent phosphorescence. Tomorrow night, we will kiss in the streets. This. I cannot even begin to express how much I enjoyed reading, how much I connected to every single word. This was truly incredible, I hope you know I look up to your writing. I cannot express how honored I feel about your comment. Thanks so much! I’m going to have to digest this one a little longer. Hmmm ? Thanks for the heads up, but the dots serve a purpose. Where they’re at and how they’re placed……….visually. It’s grammatically incorrect. 😀 But I do get your point…….. Seriously now, I get it. I understand you get “it”. But have you ever read Tender Buttons or noticed the dashes Emily Dickinson used? Then, there’s the Imagists like H.D. and Ezra Pound who used the typewriter to place words in interesting places on a page. You might want to revisit those authors or read them for the first time. On WP, we are dealing with a frame, words inside it. If we all stuck to the rules, there would be no art. Thanks, I like your comments. I haven’t seen it from that angle. It does make a lot of sense. I just have different preferences. I noticed that many misuse the punctuation and grammar, so I stick to the rules. I completely respect the artistic form and expression. I am glad I learned something today. If I overreacted, I apologize for my rushed comment. This is amazingly beautiful writing. It’s the first post of yours that I’ve read but now I want to go back and read them all and I will. Words that create “all the feels” are sometimes hard to find… I hope you keep putting your words out there for us all to feel. Beautiful and touchingly haunting, the kiss in the street, is lingering in my mind. The wires are the lines in space where lives bend, touch at a point, sway again and go on forever, parallel but not, waiting for the wind to blow again. Nice one. Inventing phosphorescence. Thanks. I’ve taken some of my posts off because of publishing. But there are still quite a few on this blog. Thanks again. Thank you for sharing, really beautiful piece. Thank you for sharing. Damn! Nice! Great! Somehow this invoked a feeling of warm disconnection, a very disconcerting state and great read. Wow! It’s refreshing to read literary art that isn’t constrained. This one had my head elves levitating. Exceptional work, loved it. This is surreal and quite real at the same time. Drive-by shootings are horror stories. Your poetry is beautiful. I love the originality of your work. Holy f*** this is good.